Information: The Irish Times, Wednesday, December 18, 1996. Will the real Irish dancing please stand up? As set and céilí dancing square up to each other, Victoria White takes notes. A letter appeared in several Irish newspapers, including this one, which some saw as a further shot in a battle they had long thought to be over. It began: "We would like to bring it to the attention of your readers that 1997 will be the centenary of the first céilí, which was held in 1897. While the first formal céilí was held in that year, many of our dances can be traced through several centuries before that." The letter went on to briefly retrace the history of céilí-dancing in this century, and to explain that due to its decline in the 1960s, a number of "fior-chéilí" (or "real céilí") clubs had been formed, which could play their part in relaunching the dancing in its centenary year. "Céilí dancing is a part of our culture which is just as important as our language, our music and our national games," it said. "Centenary year presents a challenge and an opportunity for all organisations, cultural and otherwise, to play their part in reinstating it in its rightful place in modern Ireland." The many signatories, who included representatives of organisations such as the Gaelic Athletic Association (GAA), Comhaltas Ceoltoiri Eireann, Colaiste an Phiarsaigh, and the various céilí clubs, called all interested parties to a meeting, which took place at the weekend in All Hallows College, Drumcondra, to discuss plans for the coming year. By now readers may be wondering if the reference to a battle in the top paragraph hasn't strayed in from an article on Bosnia. The initiated few will already have sensed the underlying tension, however. As Terry Moylan, founder of the Brooks' Academy school of set dancing says, in the promotion of céilí dancing, there is usually an "unspoken" criticism of set dancing, which in recent years has seen a revival in Irish cities. This suspicion is natural when you consider, that in the early 1980s, Moylan and some friends were prevented from dancing a set at a Comhaltas Ceoltoiri Eireann function. The prejudice has its roots in history. The Gaelic League, in its efforts to promote céilí dancing, banned set dancing from its gatherings, because it was based on French quadrilles. This left them with a problem, however, because they had no "truly Irish" céilí dances with which to replace the sets. The dance list for the first céilí, held before the ban by the London branch of the Gaelic League in the Bloomsbury Hall in 1897, consisted in fact, of sets, quadrilles and waltzes, danced to Irish music. The Gaelic League then busied itself with finding enough "truly Irish" dances with which to replace the sets. The hot potato is whether they restored old Irish dances to popularity, or made up new ones. Joe O'Donovan, a dance teacher at the University College of Cork (UCC), taking his lead from Francis Roche's 1957 volume, Irish Dances, Marches and Airs, says Bean Sheain O Cuirrin, secretary of the Gaelic League in Limerick, composed such staples as The Walls of Limerick and The Siege of Ennis. Tom Marry, who was elected chairman of the Steering Committee for céilí-dancing's Centenary Year at Sunday's meeting, has never heard of the woman. 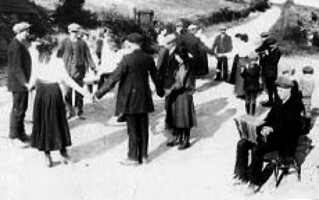 No-one denies that a few old Irish country dances were found by the "timiri" of the Gaelic League; Joe O'Donovan says that Nan Quinn from south Armagh gave them The Sweets of May for instance, and The High Caul Cap, is considered traditional by Breandan Breathnach in his volume, Dancing In Ireland. Were the newly composed céilí dances based on dances from other traditions? The Gaelic League did, after all, model its first céilí on Scottish céilís being held in London at the time, and The Haymaker's Jig, for instance, is well known in England as Strip The Willow or Drops of Brandy. Or were many of the céilí dances modelled by the old Kerry dancing masters on the pattern of the banned quadrilles, as Nicholas Carolan, Director of the Traditional Music Archive, has written in the periodical, Ceim  bringing to his aid the evidence of the famous Gaelic League dancing master, Patrick Reidy? At Sunday's meeting, many of the 30 or so delegates made comments from the floor which seemed to paint the two types of dancing as antithetical each other: one man lamented that Belfast had little céilí dancing, being "a set-dancing Mecca," while many criticised the use of the word "céilí" to describe a night of sets: "At the Oireachtas céilí in recent years, there have been two or three set dances, which is a damn disgrace," said one man. "But there'll be no mix next year when it's in Belfast, I'll guarantee you that." Tom Marry strongly denied any agenda against set dancing: "When I was a young boy playing Gaelic football, no-one asked me what I had against hurling." He added, however, that the two types of dances did not mix easily, having different steps and being based on different formations, with céilí having many, and sets always falling into squares of four couples. The loose use of the word "céilí" has led to the coining of the term "fior-chéilí", to let punters know there won't be a set in sight. This term was roundly criticised by one delegate, Eileen O'Doherty, a set-dancing teacher at Brooks' Academy, and author of The Walking Polka, as being "elitist" and "off-putting." "The reason that céilí dancing is dead is because of words like that," she said afterwards. O'Doherty began with céilí dancing, and moved on to sets quite naturally when she had exhausted the repertoire. She thinks many set dancers would be happy to try céilí dancing, especially as there are by now very few old sets left undiscovered, if it weren't for this "farcical" division that is created between them. She never allowed worries about the Irishness or otherwise of céilí or set dances spoil her enjoyment of dancing, she said. It is obviously differing attitudes to Irish identity which have caused the rift between the dancers, however. The strength of céilí dancing in the North must relate to the stronger sense of Irish identity which exists there; Terry Moylan, a piper as well as a dancer, was once asked in the North if he belonged to "the musical wing of the national struggle." It seems that establishing the Irishness or otherwise of the dances, whether céilí or set, is a mugs' game (a profitless or futile activity). Joe O'Donovan argues that many of the sets, though based on the French quadrille format of four couples in a square, are in fact, two Irish half-sets put together; and that the addition of fast and furious Irish music inevitably changed the quadrilles dramatically. However, the story he tells of the composition of First Lancers now widely danced to reels, jigs, and hornpipes as The Clare Lancers, shows what mongrels the dances can be. It was composed in 1817 for the Lancers' Regiment stationed in Dublin (apparently because they were tired of doing the "Frenchy" dances), by a Dublin-based dancing master  Monsieur Duval from France. Why was it only set dances which swept to popularity on the wave of the folk revival, then? Tom Marry explains that Conradh na Gaeilge "eased out of the céilí-dancing scene," and as the number of céilís and thus, the number of classes decreased, "a vacuum was left in Dublin, and it was filled by set dancing." His daughter, éilís Ni Mhearrai, newly appointed as youth officer of the centenary year's Steering Committee, attributes the set-dancing boom to "media hype" and "commercial interests." Joe O'Donovan says set dancing won out over céilí, because céilí "was inclined to be a bit, if you like, sedate." It was danced to a slower rhythm, and the men didn't put their arms around the women's waists: "In the Mansion House céilís in the 1930s and 1940s, there were people walking up and down to make sure you danced correctly, and behaved yourself." "The set dance thing will settle down," he says, "and people won't approach them with the wild enthusiasm they have been doing. In a few years, the set and céilí dances will be danced together." He wouldn't want to see the céilí dances die, and happily teaches both in UCC, doing his bit to overturn the dictum, which he quotes wearily: "In Ireland, if you have two men, you have to have a division."